The men didn’t know that they had less than half an hour to live. The Captain stared out at the undulating haystacks of the Bering Sea and sipped coffee with hands blackened by grease and oil. It was that painfully late time of night. The time when normal people are home, twisted in their bedsheets and dreaming. The Captain hated delays like this storm. In the age of derby style commercial fishing, time lost was money lost in the most literal sense. But this storm ranged across the entire Bering Sea, and though Alaskan fishermen were recognized around the seas for their toughness, not a boat in the fleet would be working tonight. The Captain tipped a plain black mug to his mouth and let stale, cold grit pour between his lips. His eyes never left the ocean. Seas had reached forty, maybe fifty feet. The captain watched them approach in the sodium running lights like faceless monsters, one after the next. When the boat climbed to the peak of any wave, he saw only an endless mountain range of heaving, boiling water. The other men were below, sleeping if they could. His oldest son, heir apparent to the Homebound’s captain chair, was among them. They knew the dangers inherent to the profession, but none dared imagine the inexorable truth. They were lined up before Saint Peter unknowingly in the dark bowels of their Bering Sea ship. Outside the snow streaked by in sideways tracers turned orange by the boat’s lights. White shags of ice grew thicker on the deck with each subsequent wave that breached the rails, leaving part of itself frozen behind. If the ice were to get much worse, he would have to wake the crew and force them to hammer and chisel it away storm or not. Crabbing was dangerous business. They all knew that. One mistimed wave could easily wash a man over into the black wilderness of the ocean. The only thing out there was the inky denouement of death. The radio crackled, reports from distant quadrants of the sea. The Alaskan Homebound, it seemed, was not the only boat struggling in the storm. The Captain tipped his coffee mug to his lips. The tremble in his hands was gone. His anxiety was replaced with numb exhaustion. The Captain growled and dimmed the volume. Even radio waves can’t get through this storm. He kicked at the nylon survival suit at his feet. SLAM!...a wave crashed hard over the bow, knocking the boat off heading and smothering the deck with swirling, writhing snakes of foam. The shaking in his hand redoubled. He steered the boat back onto course against the wind and fought his breathing back under control. He checked and re-checked his position. If we could only make it to the lee side of Boxer Island. By his calculations, it was only fourteen miles north-northwest. They could make it there and drop anchor to hide from the worst of the storm. In thirty years of Bering Sea work, the captain had seen things that would whiten the knuckles of even the hardest men. Fishhook eviscerations. Protruding bones. 100-knot winds. Translucent, frostbitten fingers. Yet never, not even once, had he felt as he did on this night. This was no place for a boat. And this was no night to die. Through the escalating squall the captain steered his boat. Progress was slow fighting the wind and waves. The boat, leaden with ice, was heavy and stubborn. Soon it would be as if he were driving an ice sculpture of The Alaskan Homebound and not the real ship. And he could have been Coleridge’s ancient mariner: one man alive in a world of frozen souls. Punishment for some albatross or another. Lord knew his sins were numerous. The Captain waited for his time. His coffee and smoldering cigarette rested in his right hand. On a clear day he would be able to see Boxer Island just a few miles ahead, but crooked lines of snow superimposed on a death-black background was all his aging eyes could see. That’s all there is to see. He rolled his fingertip gently over the dimpled surface of the alarm button gently but didn’t quite press.. Just a little more pressure, five maybe ten psi, the shriek of the alarm would sever the night, and the men would be awake and in their survival suits. They regularly practiced this drill. They could be ready in under two minutes. Then they might have had a chance then. Might. But he didn’t push. The men deserved rest. The night was tense but not quite a crisis. The men were scheduled to arise in an hour anyway, and in only ten more minutes he would have them all safe behind Boxer Island. They could break ice in the morning with relative leisure. The captain smiled, imagining himself telling this story over beers at The Lighthouse when they were back in port on Friday. It was in that saloon, he was well-known for proclaiming—especially too many drinks into a late night after returning from Dutch Harbor at the end of opie season—that he felt most at home. Motion caught the corner of this eyes. 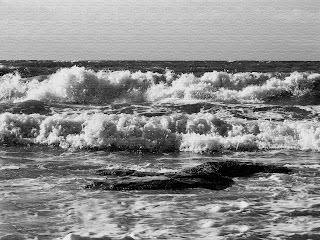 He had only enough time to register a solitary thought: rogue wave. He’d never seen one, though he knew the stories well. Fishermen’s tales, mostly, often as sensational as fantasy. But face-to-face with the real thing, he found the truth more terrible than any legend. He reached down, stabbing the alarm button at last, but it was too late. The wave struck the ship with the wrath of God. The three-inch glass of the wheelhouse, forty-seven feet above the deck, shattered on impact. The captain’s sanctuary was suddenly filled with cold and dark. He was contortioned as if in a washing machine. He sensed great movement and heard low groans from the boat underneath him. Something hard bit into his back. He heard himself screaming and tasted the salty tang of ocean. Thoughts came to him with astonishing speed and clarity: His wife and children. His crew, his son among them, being jerked awake into this cold Hell. In a moment, the violence was over and he was able to break the surface. Two feet of water sloshed back and forth across the cabin. All was dark. A strange buzzing sound filled the wheelhouse and it took him a moment to realize it was the ship’s alarm, tripped most likely by water in the engine room. A little late now. He felt around to orient himself in the darkness and realized the boat had been knocked onto its side. And the water was coming back. Slower this time. His hands closed around a stiff, pliable material in the water: his survival suit. Too late now to put this on. And too late to pray. He was bound, body and soul, to this fate. The sounds of the waves and the storm outside were deafening through the shattered windows.